Camping as a form of recreation and travel is moving up within the list of family vacation favorites, according to the 2017 Topline Report published by Kampgrounds of America (KOA), the largest purveyor of franchise campgrounds in the United States. Currently, 61% of U.S. households went camping at least once last year, and of those 14 million camped three or more times, a visible increase from previous numbers of 58% of households camping at least once in 2016. 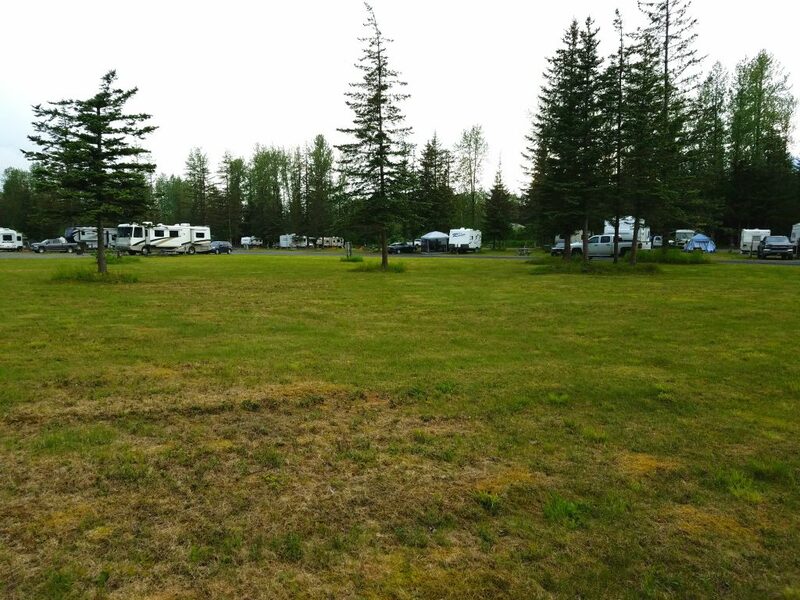 Here in Alaska, where land management agency campgrounds are plentiful and outdoor spaces expansive, some families might say there is no need for a place like KOA with its propensity for amenities like wifi, showers, and RV hookups. Let’s get out there and rough it, like the first explorers did. Yes, let’s. Then let’s go visit the Valdez KOA. The tagline used by the Valdez Convention and Visitors Bureau has long been “Even Mother Nature has favorites,” and given the beauty of this Prince William Sound community, it’s easy to see why. Valdez, a town of just under 4,000 residents, sits at the end of the Richardson Highway and the beginning of Prince William Sound in a clash of mountains plunging to the ocean in a stunningly beautiful panorama that even on a cloudy, foggy day humble those who visit. Valdez deserves respect. It is, after all, terminus of the Alyeska Pipeline and the site of near-total destruction after the 1964 Great Alaska Earthquake. 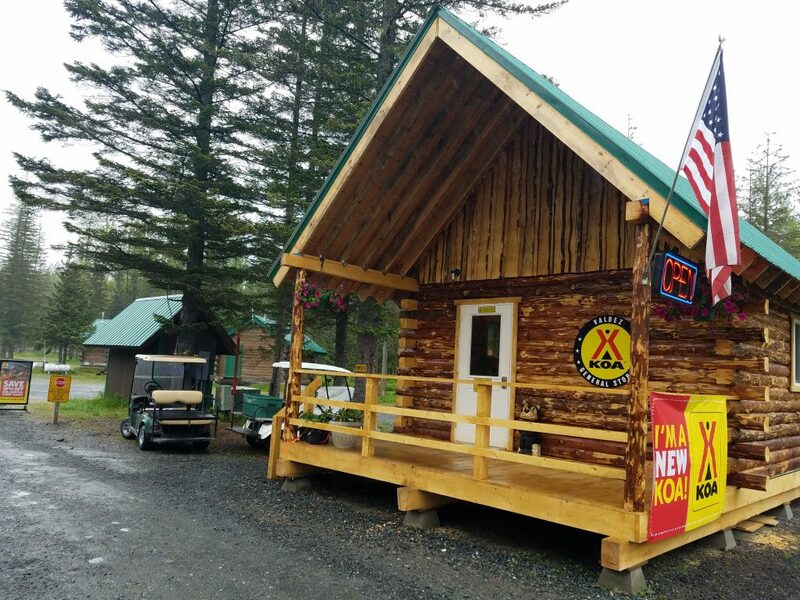 It is a place where recreation and commerce provide opportunities, whether one is in town for a day or a lifetime, and it is here that Tim and LaVerne Eickman decided to immerse themselves in KOA’s mission to provide clean, comfortable camp accommodations on 18 acres of forested land just outside town. Milepost 2 is the official location, situated along a paved bike trail leading to town, an excellent reason to bring bikes or your walking shoes. Towering Sitka spruce line the perimeter of the campground, and the Eickmans have created a wide, green lawn that begs for kids to toss a baseball or Frisbee after a busy day of exploring Prince William Sound, Thompson Pass, and local historical sites. 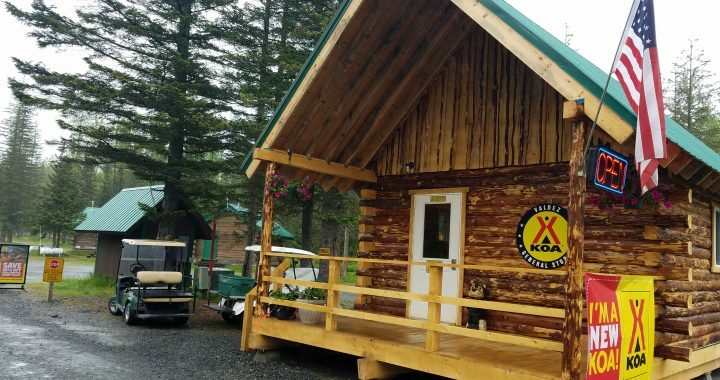 Appealing to nearly every type of outdoor enthusiast, the Valdez KOA looks to serve Alaska visitors with 100 campground sites for tents and RVs, and five small cabins that have been charmingly redecorated and refurbished to reflect the spirit of Alaska. For RVing families like us, we appreciated the Eickman’s attention toward creating level sites with hookups for power and water, especially last weekend during our two-night drizzly stay. 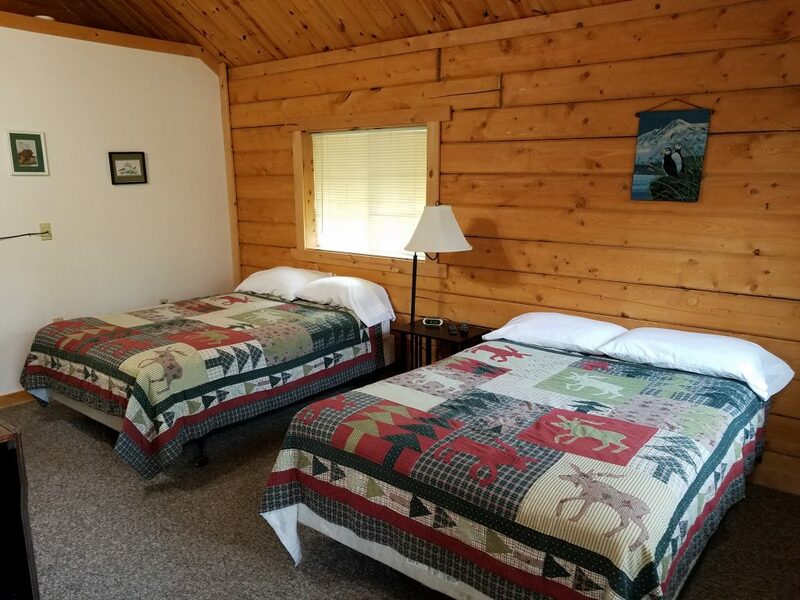 LaVerne placed us near the shower house/laundry/restrooms, and within easy view of the new office, a little log cabin that boasts a small store for all those things you didn’t know you forgot. Guests came and went all weekend, an interesting mix of tent campers and RVers like us, plus a few folks who obviously live there seasonally for work in the tourism or fishing industry. Everybody was kind and friendly and offered plenty of suggestions for “what to do” with a few days in this unique seaside community. We kayaked with Pangea Adventures one morning on a two-hour tour of Duck Flats near the confluence of the Lowe River and town and where the original Old Valdez Townsite is within view. Shorebirds poked around in the mud and mother seals kept a close eye on their pups as our boats came into view. The drive into downtown was but a few minutes long and afforded us a chance to stop by the Chugach National Forest visitor center just before we entered the city proper. Here, you can pick up a map, read some information about the area, or give the kids a chance to become Junior Rangers. We walked the KOA property before bed one night, listening to the chatter of other campers and enjoying the heavenly aroma of multiple barbeques fired up around the campground. A small pond in front of the cabins also provided a bit of evening entertainment when a Teal duck emerged from the tall grass with 11 newly-hatched ducklings. Their spirited antics as they took to the water reminded us that everything is new when you’re young, and adventure is a state of mind. In Valdez, that is a given. Bike path at entrance that leads to Valdez and Dayville Road and the Solomon Gulch Fish Hatchery and shoreside fishing sites. Beware of bears at all times. Office/store offers sundry items, including RV necessities and a small gift shop. Open 8 a.m.-8 p.m. Check in, 3 p.m. 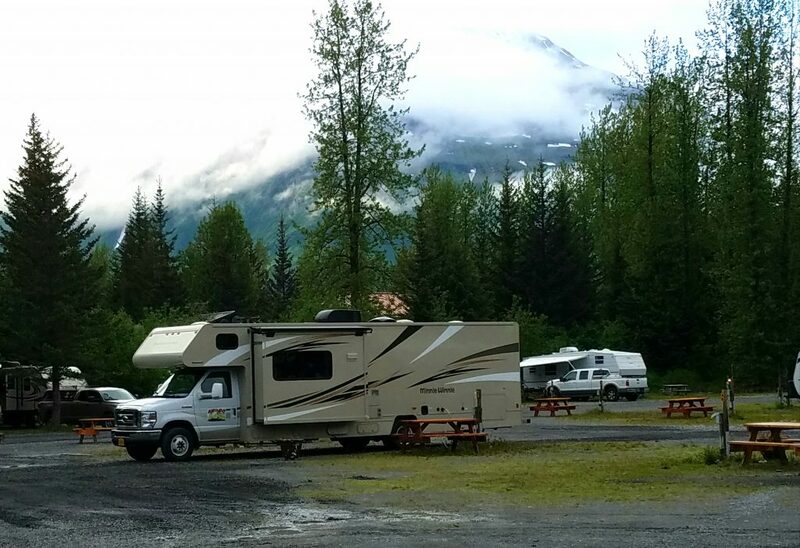 Check out, 11 a.m.
A nifty KOA app can help planning for other KOA trips, like our Iowa to Alaska adventure in 2016. 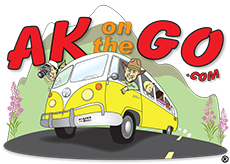 *AKontheGO received a hosted RV site for our weekend at the Valdez KOA. 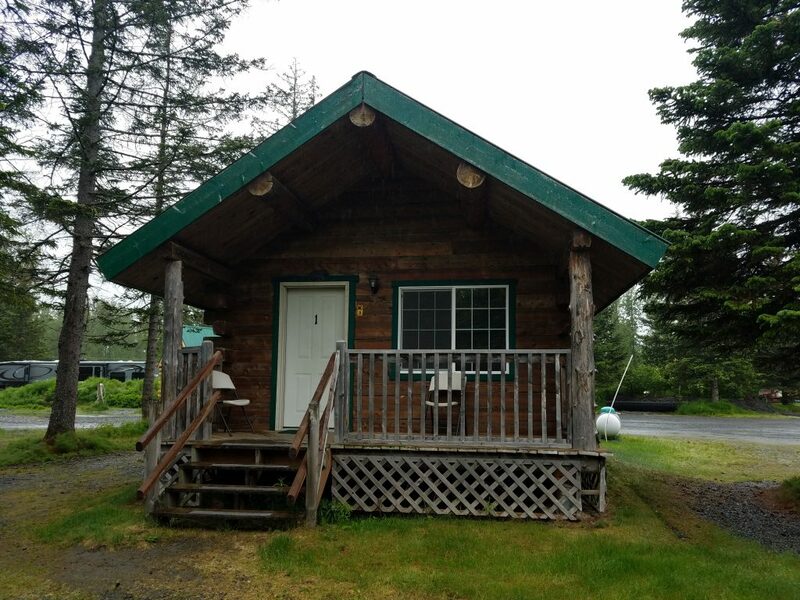 Posted in Alaska Road Trips, Richardson Highway-Valdez and tagged Alaska Travel, Alaska with Kids, camping Alaska, Family Travel, Kampgrounds of America, KOA, Prince William Sound, Richardson Highway, Valdez, Valdez KOA.